Matte outer finish with high-gloss inner finish Accentuate and complement company colors. Ceramic body with a classic, contoured style. 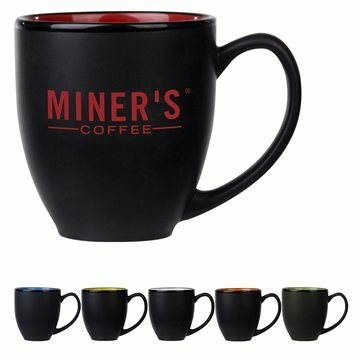 Holds 14 oz of your favorite morning blend. Add delight to your morning with a colorful interior. Ear-shaped handle fits 4 fingers comfortably. The screen printing on the mugs was great, the quality of the mug surpassed our expectations, and the turnaround time was quick! Thanks! I am extremely happy with the product! And Rosa was awesome! I am pleased with the product. Good product for the price. the imprint could have been a bolder. Fantastic buy and very useful. All of them came out wonderful. This is not the cheap, loose ones you find in dollar stores.